The Broadcast Settings page holds some key information, especially if you plan on using an encoder made by a 3rd party. 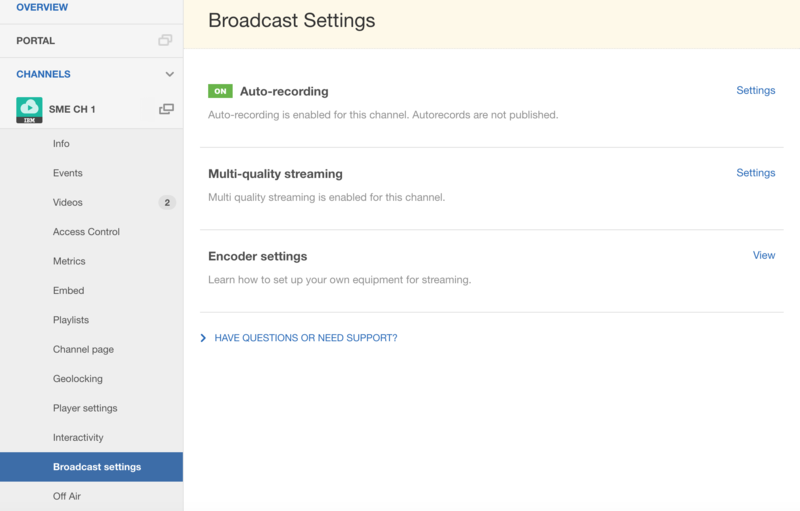 There are three sections to this page: Auto-recording settings, Multi-quality streaming settings, and Encoder settings. 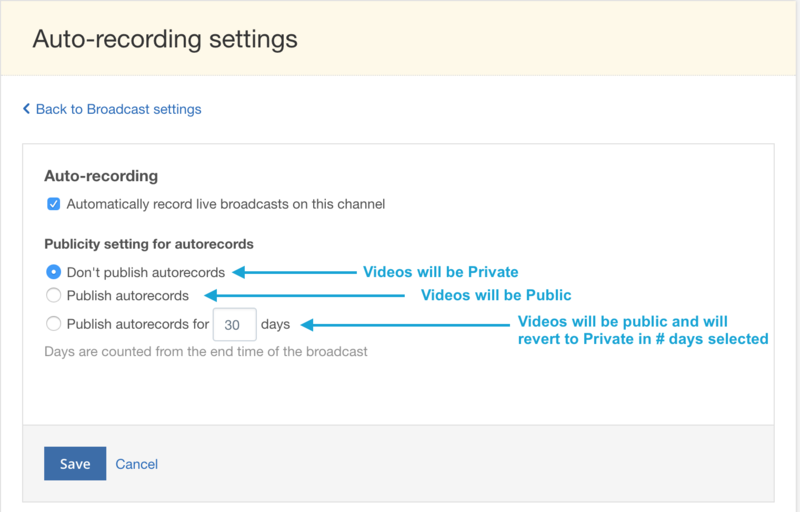 To toggle Auto-Recording on and off, simply click or un click the checkbox next to 'Automatically record live broadcasts on this channel'. You can also choose whether or not these videos are automatically made public, or kept private, after they are created. You can even publish auto-records for a desired amount of days before reverting back to private. You can change this from the "Publicity setting for auto-records" selection. Remember to save your changes at the bottom of the page before exiting. You can see that the video is labeled 'Unsaved', and the deletion date (30 days after broadcast) is given. You can save these videos, and remove the deletion deadline, by selecting the video and choosing Save Auto record from the 'More' dropdown menu. For further information on managing videos on your channel, please look here. Not all viewers have the same amount of bandwidth on the device they are watching from. Your crisp and clear 720p or 1080p video might be too much for their device to handle. Because of this, IBM Watson Media offers the ability to have a lower quality 240p stream simultaneously generated and made available for viewers. 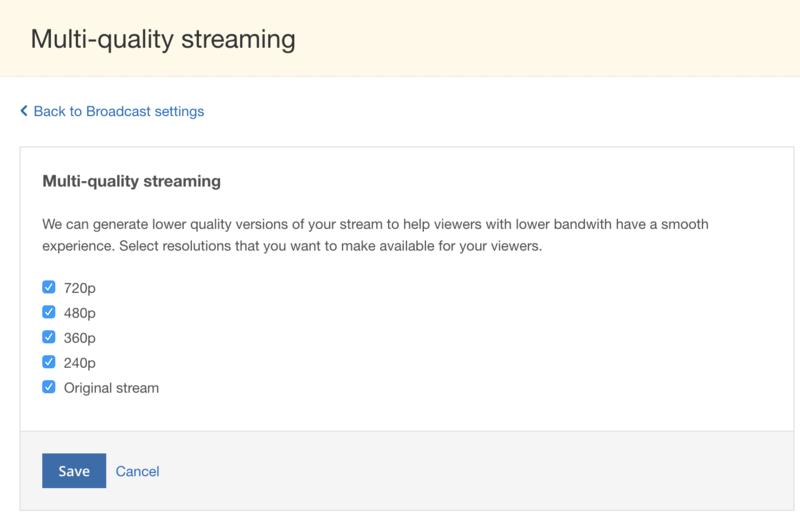 You can make this available by clicking the Settings button to the right of the Multi-quality streaming feature. Here you will see a toggle button to turn this feature on and off. Remember to save your changes after making them. When a viewer visits a channel with multi quality streaming enabled, they will see a pop up in the lower right corner of the player that will allow them to toggle between your full quality stream, and the 240p stream enabled. 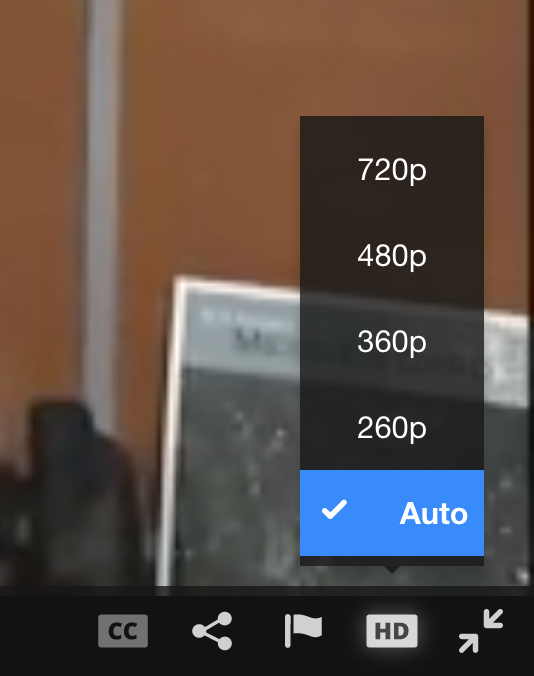 This option may take a few moments to appear when a stream is first beginning. The Encoder settings tab is extremely important for any broadcaster who plans on broadcasting from a 3rd party encoder. Any encoder, such as the web broadcaster (the Go Live button) or Ustream Producer, knows where to stream to because you use your IBM Watson Media/ Ustream credentials to log in. A 3rd party encoder, such as Flash Media Live Encoder or Wirecast, has at first no idea where to stream to, or whether you have permission to do so. You get these credentials from this Encoder settings tab. Click on View to access the tab. The manual entry field contains two values: your RTMP URL and your Stream Key. The first acts as the destination of your stream- it is your channel's address. The second is your authentication key- it acts as your password. Any encoder will have fields that will take these values as input. You will need to input these values into these fields in order to stream onto your channel. These fields, and their names, may vary from encoder to encoder. Be sure to consult the manual of your individual encoder to determine how they name these fields. 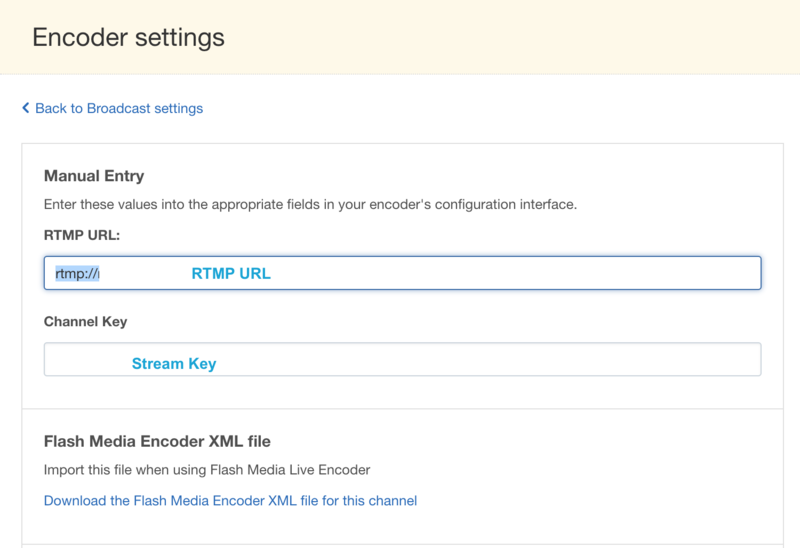 Some encoders will allow you to import these values, and certain standard settings, in an XML file which can be downloaded and then uploaded to your encoder. This link allows you to download this file. This field offers some helpful links on preferred encoding specs and streaming settings to be utilized when streaming using 3rd party encoders. When streaming using a 3rd party encoder, some of the functionality of the web broadcaster (the Go Live button) will be missing- for example, the web broadcaster allows you manually record content on your channel directly from the broadcaster itself. The Remote Record Console allows you to have this functionality even when using a 3rd party encoder. Click the Launch Remote Console button to open the console. Pushing this button will open a pop up that allows you to manually stop and start recording on your channel when a broadcast is live, or initiate polling of the audience.